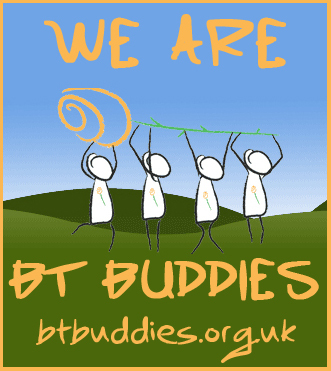 What is a Brain Tumour (BT) Buddy? A BT Buddy is a friend to all those affected in anyway by a brain tumour. Many help to raise awareness of the disease and campaign for early diagnosis, better treatments, more clinical trials and greater funding for research. The menu on the right of this page directs you to some of our BT Buddies. Some write their own blogs, others share their stories via Facebook or Twitter. Checkout the links and help support others travelling the brain tumour road. We have various profile badges that we have created for events/special dates throughout the year as well as general badges you can display on your blogs, Facebook and Twitter pages. You can see the badges below and we will be adding details on how to download or link to them shortly.